Purpose: Ventral hernia repair is one of the most frequently performed surgical procedures, though recurrences are common. 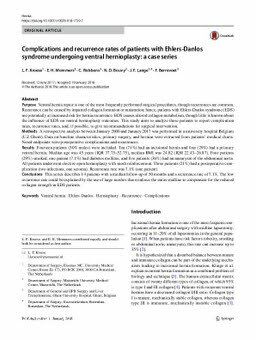 Recurrence can be caused by impaired collagen formation or maturation; hence, patients with Ehlers-Danlos syndrome (EDS) are potentially at increased risk for hernia recurrence. EDS causes altered collagen metabolism, though little is known about the influence of EDS on ventral hernioplasty outcomes. This study aims to analyze these patients to report complication rates, recurrence rates, and, if possible, to give recommendations for surgical intervention. Methods: A retrospective analysis between January 2000 and January 2017 was performed in a university hospital Belgium (UZ Ghent). Data on baseline characteristics, primary surgery, and hernias were extracted from patients’ medical charts. Noted endpoints were postoperative complications and recurrences. Results: Fourteen patients (50% males) were included. Ten (71%) had an incisional hernia and four (29%) had a primary ventral hernia. Median age was 45 years (IQR 37.75–52.75), median BMI was 24.82 (IQR 22.43–26.87). Four patients (29%) smoked, one patient (7.1%) had diabetes mellitus, and five patients (36%) had an aneurysm of the abdominal aorta. All patients underwent elective open hernioplasty with mesh reinforcement. Three patients (21%) had a postoperative complication (two infections, one seroma). Recurrence rate was 7.1% (one patient). Conclusions: This series describes 14 patients with a median follow-up of 50 months and a recurrence rate of 7.1%. The low recurrence rate could be explained by the use of large meshes that reinforce the entire midline to compensate for the reduced collagen strength in EDS patients.